where psi and pw are the density of sea ice and ocean water, f is the Coriolis parameter, ta and tw are the frictional force from wind and ocean currents, expressed as shear stress per unit length, hw is the sea-surface height, and o is the internal stress field in the sea ice. The second-to-last term captures the pressure gradient associated with sea-surface slope, and the final term describes deformation in the ice pack, which extracts energy from the mean flow. In other words, internal deformation, through processes such as rafting, ridging, and shearing of ice floes, take up some of the energy provided by wind and ocean drag, limiting the acceleration and motion of the ice pack. These processes also shape the thickness distribution of the ice pack, with major feedbacks on ice thermodynamics. In free drift, sea-ice flow is predominantly wind-driven, with Coriolis deflection giving motion that is commonly 30° to 60° to the right (left) of the wind in the Northern (Southern) Hemisphere. Surface water currents in the ocean are also strongly wind-driven, so these frictional forces commonly collaborate in propelling sea-ice motion. Calculation of internal deformation in sea ice, V • o, requires a constitutive relation or rheology that describes how ice deforms under stress. Ice is an unusual solid in that it exhibits elastic, viscous, and plastic behaviors, depending on the timescale and the nature of the stress that is imposed. The slow, viscous (tertiary creep) deformation that is of great interest for glaciers and ice sheets is not of much relevance to sea ice, but elastic flexure and plastic failure are common modes of deformation in shifting pack ice. Sea ice is commonly modeled as a vis-coplastic material, which means that it deforms linearly with stress until loading stress reaches the yield strength, beyond which the material fails (i.e., sea ice will fracture and break up). Sea ice is modeled as a continuum, so explicit models of fracturing or shattering are not usually entertained; treating sea ice as a plastic material mimics this decidedly discontinuous process. Plastic deformation can describe sea-i ce rifting (opening of leads) and ridging, two of the most important mechanical processes. Sea ice has also been described as a cavitating fluid, which is weak under tension but has a high yield stress under compression. This can mimic sea-i ce behavior, while being simpler computationally then a full plastic rheology. It is also possible to model sea ice as an elasto-viscoplastic material, where elastic deformation is of interest. This is the case in some engineering applications, such as calculation of sea-ice stresses on marine structures (e.g., bridge abutments, drilling platforms). conical (sloping) abutments are designed to permit sea-i ce "ride up" under elastic flexural bending, minimizing stress on the structure. Similar elastic processes are relevant to sea-ice deformation when pack ice floes converge. Sustained convergence inevitably leads to either rafting (one ice floe overriding the other, common in thin young ice) or ridging (failure under compression, leading to crumpling and a thick, jumbled suture zone). Rules are needed to describe ice ridging and the changes in ice thickness distribution and ice-covered area associated with this process. Internal forces and mechanical dissipation in the ice pack also play an important role in ice thickness distribution. Rafting, ridging, and shearing are the main processes that create thick ice beyond thermodynamic growth limits. This is difficult to model in a fixed-grid, Cartesian framework, so two approaches are commonly adopted. One is to simulate the mean ice thickness in a grid cell, along with the area of ice cover (or areal fraction within the grid cell, also called the compactness). Together these give the ice volume. Converging ice floes as well as thermodynamic growth will increase the mean ice thickness and compactness, subject to conservation of energy and mass (volume). Melting thins the ice pack. As a refinement to this approach, many models adopt a statistical distribution of the ice thickness distribution in a grid cell (e.g., normal distribution, bimodal distribution, etc.). The probability distribution function for this is denoted g (H), for ice thickness H, as illustrated in figure 5.5. The distribution can then be sampled at discrete intervals in order to simulate sea-ice evolution for different ice-thickness categories. 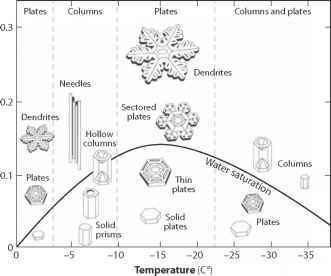 Thermodynamic growth and melting of the ice proceed at different rates as a function of ice thickness, and mechanical effects a. Figure 5.5. Illustration of sea-ice thickness distribution, g(H). [Adapted from Bitz and Marshall (2011).] (a) The line depicts a hypothetical ice distribution in an ice-filled grid cell with a combination of first-year and multiyear ice (modal thicknesses of ca. 1 m and 4 m). The histogram illustrates a potential discretization ofg(H) into ice-thickness categories for sea ice modeling. (b) A hypothetical shift in g(H) as ice is melted and open water is created in the region. The thin and thick lines indicate the original and new ice-thickness distributions, respectively, with the shading indicating areas of net "gain" of probability. ablation from lateral melting. The first term on the right-hand side includes changes in ice thickness distribution due to both divergence in the ice pack ( gV • u, for mean velocity u) and advection of the distribution (u • Vg). The second term on the right-hand side couples Eq. (5.7) with the thermodynamic equation for ice growth or melt, Eq. (5.4). Rates of change, dH/dt, are resolved separately for the mean ice thickness in a specific ice-thickness category, as determined by the method selected for discrete sampling of the probability distribution function.